Home Enews Photos (Photo) Kicks: Nike Kyrie 2 Kyrache Detailed Look & Release Info! (Photo) Kicks: Nike Kyrie 2 Kyrache Detailed Look & Release Info! 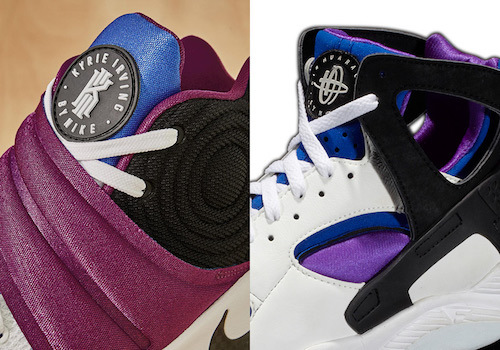 A couple months ago we learned that there will be a Nike Kyrie 2 & Nike Flight Huarache collab known as the Kyrache the story behind this collab is the Nike Air Flight Hurache was born in 1992 & so was Kyrie Irving so why not have a dope collab. This sneaker has an all white upper followed by white laces you also have that purple strap blue tongue & that classic Hurache logo with your kyrie branding which really gives the sneaker that Huarache feel you also have Black side panels completing the sneaker you have an all white midsole with a Black Nike swoosh on the ankle followed by a white bottom sole. As far as a release date is concerned the Nike Kyrie 2 is set to release on June 7th with a retail price tag of $120.00 MSRP!. Peep The Gallery To See Detailed Images Of The Upcoming Nike Kyrie 2 Karache After The Jump….